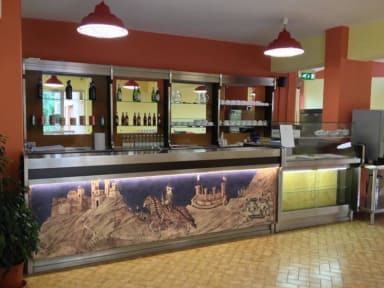 Less than two kilometres away from the center and in excellent connection with public transport you can find our Siena Hostel Guidoriccio. We are placed in a green, friendly neighborhood, yet the bus allows our guests to reach the historic part of Siena in few minutes. We offer everything a traveller could ask for; privat rooms and dorms, long reception hours until 11pm, parking spots, breakfast until 10am, towels and laundry service if needed and of course wifi. However, our hostel is not just an accommodation for sleepy passengers, but a center that provides our guest with information, tours and tips about the tuscan lifestyle. As we work hand in hand with several farms and vineries we want you to try the best and most typical italian food and wine and get an authentic experience in beautiful central Italy. The hostel has 46 rooms, equipped with latex mattresses and wooden slats. Each room also has a wash basin. Sheets and linen are included. Bathrooms are located on floors and all with hot shower facilities.